Radiofarda – President Hasan Rouhani’s remarks at commemorations in Tehran on January 9 and 10 to mark the second anniversary of former President Akbar Hashemi Rafsanjani’s death has revealed rifts at the top level of Iran’s political system. This comes while Rafsanjani’s death still remains shrouded in mystery and conspiracy theories fanned by hardliners in Tehran and Qom and occasional comments by the former president’s family. Rouhani pointed out two matters among other things that could well annoy Supreme Leader Ali Khamenei. One was about who will replace Khamenei after his death, and the other was about how Khamenei rose to power assisted by Rafsanjani. Rouhani has reportedly said during his remarks that “We staged a revolution so that no son would succeed his father”. This remark goes into the heart of rumors about Khamenei laying the foundations for his son Mojtaba to succeed him. 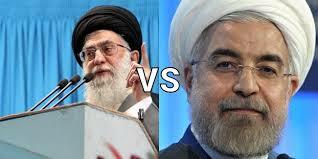 Rouhani’s remark will be seen by many in Iran as simply a snub to Khamenei. Moreover, there are also rumors about Rouhani’s intention to continue his political career beyond his presidency as a contestant for the role of Supreme Leader after Khamenei’s death. A video that surfaced in 2018 shows Khamenei’s election as Supreme Leader, where he says he is not qualified. The other Rouhani remark that would be upsetting for Khamenei is how he came to be Supreme Leader. Rouhani clearly reminded his audience and Khamenei that it was Rafsanjani who made him the Supreme Leader in 1989. Rouhani praised Rafsanjani for his role in resolving Iran’s various crises at different points during his career, particularly in sorting out the power vacuum that could have endangered the regime following Khomeini’s death in 1989. The episode ended with Rafsanjani grooming Khamenei as the next leader and convincing the Assembly to name him the new Supreme Leader of the Islamic Republic. Based on a video that surfaced on YouTube in 2018, Rafsanjani at the time convinced Assembly members to accept Khamenei as “a temporary leader” and said that later there would be a referendum on whether to have a person as Supreme Leader or to have a council of clerics to lead the Islamic Republic. The referendum never took place. In the video, Assembly members question Khamenei’s credentials as a high-ranking cleric (Mojtahed), but Rafsanjani is seen quickly derailing the challenge by presenting anecdotal evidence to prove that Khomeini had in fact presumably named Khamenei as his successor. As Khamenei entrenched himself in the Supreme Leader’s seat, he gradually built his own power base among the clergy and the military, paying less attention to the wishes of Rafsanjani. The final blow to their once close relationship came in 2009, when Khamenei backed the re-election of Mahmoud Ahmadinejad. Elsewhere in the speech Rouhani praised Rafsanjani for “prudently” ending the 8-year-long war against Iraq by convincing Khomeyni that it was in Iran’s interest to accept a cease-fire. Rouhani also added that Rafsanjani was instrumental in saving Iran from a deep crisis left after a 1981 explosion that killed over seventy of the country’s middle ranking and top managers at the time. It was known for a long time that Rouhani was a protégé of Rafsanjani but it still comes as a surprise that he would publicly make remarks, potentially so annoying to the Supreme Leader.